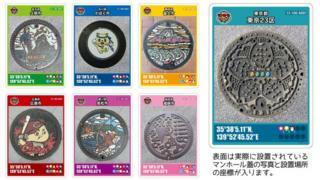 A Japanese company is hoping to raise the profile of the sewage industry by giving away collectable cards featuring manhole covers. The cards are printed with pictures of the country's unusually elaborate drain covers, and are the brainchild of GKP, a consortium of local governments and the sewage department of Japan's Infrastructure Ministry, The Japan Times reports. They come with a full explanation of the design's meaning as well as the cover's exact geographic coordinates, should the enthusiast feel moved to pay their favourite a visit. According to the Japan Visitor website, the covers attract a special kind of tourist - "drainspotters" - who visit from around the world to see their distinctive designs. The covers often feature a symbol specific to an area or town, or a local mascot. Designs are decided upon after asking the public for ideas, or through competitions, GKP spokesperson Hideto Yamada says. To be launched at a "manhole summit" in Tokyo later this month, the first batch of collectors' cards, developed with the help of a toy company, will be given away free to anyone who visits sewage plants or water treatment facilities, GKP says. If that's not enough for the drainspotters, the company says it's planning a second batch of manhole cards for release in July. A reference to the Soviet dictator in a line of dialogue was changed to Adolf Hitler. Answering life’s questions through daily features, quizzes and opinions.